“It’s not an exaggeration to say that generations of Poles have waited for this moment since the end of WWII, generations that dreamed of being part of the just, united, democratic, and truly free West,” President Duda said during a visit to Orzysz, a town less than 60 kilometers south of Russia’s Baltic Sea enclave of Kaliningrad. 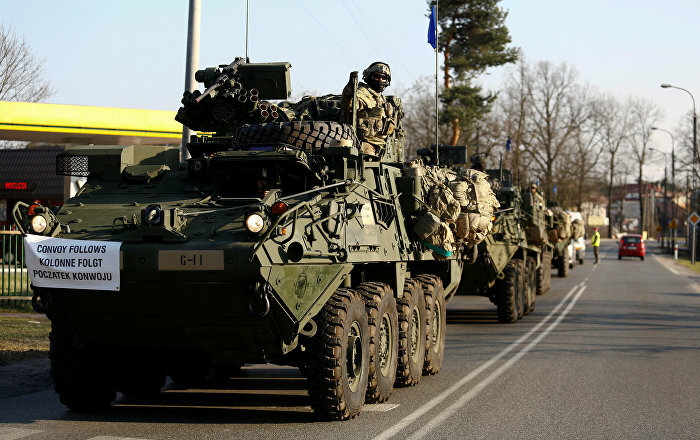 More than 1,100 soldiers — 900 US troops as well as 150 British and 120 Romanians are currently stationed in Orzysz. Just as the Polish leaders rolled out the red carpet for the NATO troops, Otomedia, a news portal in the country’s southwestern region of Lower Silesia, reported that a 28-year-old Polish man had been beaten up by drunken US soldiers when he tried to defend a young girl they were accosting. Someone called the police, which briefly detained the Americans, but released them shortly after. Even though ignored by mainstream media, the news about the incident quickly went viral through local media outlets. In an interview with Sputnik, former Polish MP Mariusz Olszewski said that, unlike President Duda, the Poles had never dreamed about inviting any foreign troops to their country. “What the Poles have always dreamed of, however, is to be able to live an economically developing sovereign and independent country. Not one of us who knows our history will dare say that having foreign military bases deployed on the territory of a sovereign country, no matter for how long, will make Poland more independent and sovereign than it is now,” Olszewski told Sputnik Poland. “Unfortunately, this is exactly what is now happening in Japan and Italy. These are the side effects of having young soldiers around who often go on leave,” he noted. What really bothers me is the total lack of information we have about the terms of the US troops’ presence in Poland. We need to know what happens if a conflict flares up between Polish and American citizens, how much we pay for their presence here. According to media reports, the recent NATO summit in Poland cost the country 178 million zloty (around $44 million). “This is not an amount of money Poland can afford to spend. We have more important things to spend on,” he emphasized. The NATO deployment at Orzysz is separate from a US battalion of 3,500 troops that arrived earlier this year and is currently based in southwestern Poland near the German border. NATO units, led by Germany, Canada, and Britain, are also being deployed this year in Lithuania, Latvia, and Estonia. NATO has been boosting its military presence in Europe, particularly in Eastern European states, since the outbreak of the Ukrainian crisis, citing Russia’s alleged interference in the internal conflict as justification for the move.